God’s love does not distinguish between the infant in the mother’s womb or the child or the youth or the adult or the older person. In each one God sees His image and likeness. Human life is a manifestation of God and His glory. Marking its 13th annual event, thousands of tristate residents will gather at Newport’s Riverfront Row festival area Sunday, June 3, 2018 to celebrate the beautiful gift of human life regardless of age or stage, ability or disability. All are welcome to join this family-friendly event to cross the Purple People Bridge and fill it with the joy of life. Festivities begin at 1:00 p.m. including music by popular Easter Rising band; free face painting; balloon artists; and fruit, water, and t-shirts while they last! Several food trucks will also have treats for purchase. Parking is available at several lots near the Levy. The walk begins after a brief program at 2 p.m. featuring emcee Anna Mitchell, producer/host, Sacred Heart Radio; Bobby Schindler, President, Terri Schiavo Life & Hope Network; the Most Reverend Roger Foys, Bishop, Diocese of Covington; Most Reverend Dennis Schnurr, Archbishop, Archdiocese of Cincinnati; vocalist Allison Riegler; and American Heritage Girls color guard. Bagpipers from the Ancient Order of Hibernians will again lead walkers across the bridge. The event will end back at Riverfront Row with more rousing music by Easter Rising and still-open food trucks. 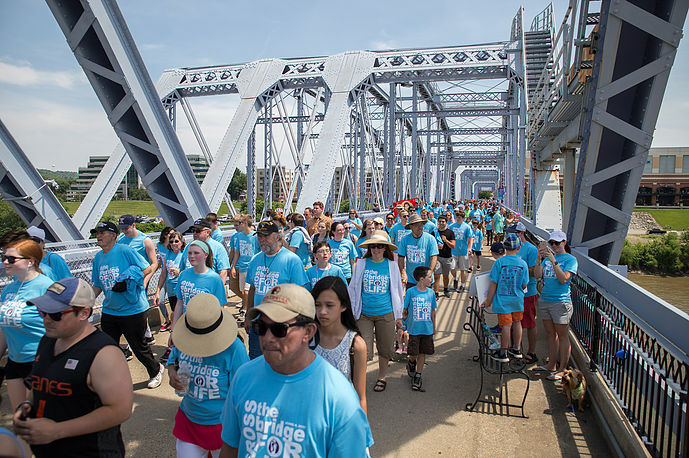 A coalition of more than 20 area pro-life organizations presents Cross the Bridge for Life, and several will have informational booths at the event. For more information on this life-affirming event and complete coalition and sponsor lists, see CrossTheBridgeForLife.com, and join the fun on Facebook! Note: This event has never been cancelled due to weather, but should this ever be necessary a notice will be posted on the web site homepage and Facebook page.